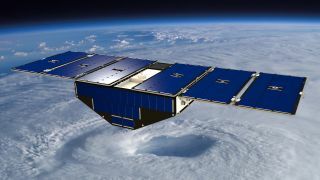 An artist's illustration of one of eight Cyclone Global Navigation Satellite System (CYGNSS) NASA satellites in orbit as part of a novel hurricane-tracking space mission. The CYGNSS satellites will launch Dec. 12, 2016. With some help from NASA satellites, the Global Positioning System could be key to getting a better understanding of hurricanes, and help improve forecasts for their strength when they make landfalls. The Cyclone Global Navigation Satellite System (CYGNSS) mission will use radio signals from the GPS satellites to measure the wind speed near the ground in the tropics, between 35 degrees north and 35 degrees south where most hurricanes are born. CYGNSS is scheduled to be launched from Cape Canaveral, Florida on an Orbital ATK Pegasus XL rocket on Monday, Dec. 12, at 8:24 a.m. EST (1324 GMT). The rocket will be carried up to launch altitude by its L-1011 Stargazer carrier airplane. You can watch the launch live here, courtesy of NASA TV, beginning at 6:45 a.m. EST (1145 GMT). "Hurricane forecasts have been steadily improving," said Chris Ruf, CYGNSS principal investigator and a professor of Atmospheric Sciences and Electrical Engineering at the University of Michigan. "Forecasts of intensity have not improved anywhere near as much." That's where CYGNSS data could help. The $157 million CYGNSS mission consists of eight small satellites, which will orbit the Earth at an altitude of about 316 miles (508 kilometers), inclined at 35 degrees. "CYGNSS is receive half of radar transmitter," said Ruf. "The other half is the GPS satellites." The group of spacecraft will measure wind speed, using reflected GPS signals. The Earth's surface acts like a mirror, and reflects the GPS signals back into space. If there is no wind, the signal is relatively clear, just like the light from a reflected moon is clear on calm water, Ruf said. When the wind picks up, the "image" formed by the radio signals is blurry because the radio waves scatter, in the same way that a reflected moon on the water is broken up by wavelets. Wind speed is an important gauge of a hurricane's strength. Current satellite images of storms can only be taken once every three days, said Ruf, because it takes that long for the craft to return to the same spot over Earth's surface. CYGNSS will be able to get measurements every seven hours, which is important for tracking changes that can happen in less than a day. The Orbital ATK L-1011 Stargazer carrier plane arrives at its Cape Canaveral Air Force Station runway in Florida on Dec. 2, 2016 ahead of its Dec. 12 launch of the Pegasus XL rocket (attached to the plane) carrying NASA's eight Cyclone Global Navigation Satellite System. Another issue is the wavelength of the radars that existing satellites use. The now-ended Tropical Rainfall Measuring Mission, for example, couldn't "see" wind speed because it uses radar at a wavelength designed to see rain. GPS satellites transmit at a 19 centimeter wavelength (about 1500 megahertz) which means they can "see" through the precipitation. The airplanes that fly into hurricanes give better measurements of wind speed, as well as their vertical structure. But airplanes need to be flown into the storm and one would need to make multiple flights to get good coverage, aside from the danger to pilots and crews. Weather permitting, on Monday morning, the aircraft will take off from Cape Canaveral Air Force Station and fly to an altitude of about 40,000 feet (12,192 meters). At that point the Pegasus engines will fire and the plane will veer away. The Pegasus will take the eight satellites into low Earth orbit. The CYGNSS satellite constellation, launching Dec. 12, 2016, from Cape Canaveral, Florida, will monitor the most hurricane-prone regions of the Earth. Top panel: Historical storm tracks. Bottom left panel: CYGNSS measurements from one orbit over 1.5 hours. Bottom right panel: CYGNSS measurements from 15 orbits over 24 hours. The satellites have no propulsion. Instead, to adjust their distance from each other and avoid "lapping" as they go around the Earth, they are able to re-orient themselves so that the flat solar panels will face in different directions. This "drag maneuver" will slow them down, because even in low Earth orbit there is a tiny amount of air, said Aaron Ridley, a CYGNSS scientist with the University of Michigan. The satellites also don't have the same kind of redundant systems that more expensive and heavier satellites do. "CYGNSS very few redundant systems," said Ruf. "We have eight satellites, and we need six to meet our requirements." Even though that meant that the failure of a single component can cause a satellite to fail, it made them much easier to build, he said. CYGNSS will never replace the airplanes, Ruf said, but it can complement their measurements; in fact the aircraft will help to confirm that CYGNSS data is accurate. The eight CYGNSS hurricane satellites undergo tests before being attached to their Pegasus XL rocket for a Dec. 12, 2016 launch from Cape Canaveral, Florida. Hurricanes won't be the only object of study. "Part of the science team is working on studies of soil moisture, and understanding the [Madden-Julian Oscillation]," which influences rainfall over the Indian Ocean, said Mary Morris, a doctoral student with in climate and space sciences at the University of Michigan. The total mission lifetime is about two years, but the planners hope that it might be extended, depending on the condition of the satellites and how good the data they return is.